Day 20 The Madeleine I’m getting hopelessly behind on my daily cookie posts so I think I’ll have to simply write off those days I missed. 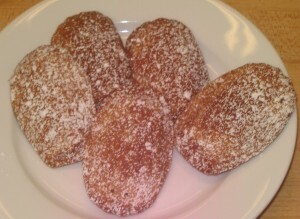 We’re back today though with the madeleine! The first thing to note about this great French sponge cake is its shape. Proust describes it as “a seashell cake so strictly pleated outside and sensual inside”. The origin of this delicious confection dates back to as early as 1755 in the French town of Commercy. It is said that the duke while visiting the town was very taken by a cake made by a peasant girl named Madeleine. This started the fashion of calling these cakes by that name as they were then called by the duke. We hope you’ll be just as taken by the way we make them here at the bakehouse!